The McLane RAS Remote Access Sampler is a time series water sampler suitable for both deep water or coastal areas. 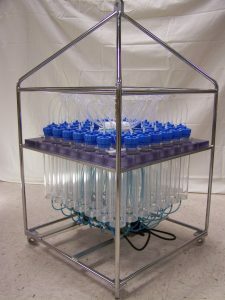 It is used to collect a series of water samples for analysis for biological, dissolved major and minor nutrient, dissolved trace metal, or dissolved organic carbon studies. The RAS sampler collects ambient water and suspended material in Tedlar® bags, isolating the samples for subsequent laboratory analysis. There are two models: The RAS-500 collects 48 samples of 500ml each and the RAS-100 collects 48 samples of 100ml each, as programmed by the user. The RAS sampler can be programmed for pre- and post- acid flushes to clean the intake pipework and eliminate bio-fouling. During deployment, data including a report of sample event conditions is stored in non-volatile EEPROM memory and may be downloaded when the instrument is recovered. On option, a RAS sampler can be fitted with in-line pre-filters to catch suspended matter, and an external temperature sensor. To download the RAS-100 data sheet click here. To download the RAS-500 data sheet click here.